Environmental remediation using photocatalyst has been the most intriguing issue in many countries for the past decade. While various research areas on photocatalysis have been studied, the immobilization of photocatalyst on a specific substrate, in particular, has attracted many researchers’ attention due to the versatility of application. In this article, plastic optical fibers(POFs) were considered as light-transmitting media and substrates for the potential use in photocatalytic environmental purification system, comparing with quartz optical fibers(QOFs). It is concluded that the use of POFs is preferred to QOFs since the advantages such as ease of handling, lower cost, relatively reasonable light attenuation at the wavelength of near 400 nm can be obtained. And also, this system has been identified to achieve two main goals; transfer of light and volumetric reaction among the various immobilized reactor system. The incident light on one end of fiber transmits to the other end by total reflection if clad(made of fluorinated PMMA, F-PMMA) exists which has lower refractive index than core. Once the clad is peeled off and then photocatalyst is coated on the surface of the fiber, refracted light can be absorbed due to higher refractive index of photocatalyst than that of core material. 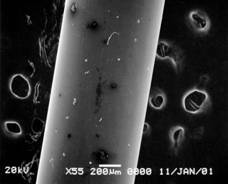 The core of the optical fiber can be made of quartz or polymer(mostly polymethyl methacrylate, PMMA). The former has relatively lower light attenuation(102 ~ 1 dB/km at the range of 300 ~ 800 nm), but it is very difficult to handle and its cost is expensive. For this reason plastic optical fibers(POFs), which are inexpensive, flexible, resilient, tough, and weather resistant at temperature range of -55 ~ 70℃, were chosen to achieve the same goals of OF systems and resolve the aforementioned problems of the QOFs simultaneously. Using POFs in photocatalytic system can be promoted by the fact that the light attenuation difference hardly affects the reactivity in such a short length of transmittance and solar light and UV-A lamp in the absence of light < 300 nm does not degrade POFs’ core structurally. Pretreatment of POFs could not be done either thermally or physically because the materials of core and clad is very similar to each other. Solvation using appropriate solvent was finally chosen to remove the clad of POF. After removing the clad from POF with 1 mm diameter, the resulted diameter should be close to 0.98 mm(matched with data by supplier). Clear proof of change in diameter of the POF was obtained by SEM (JSM 5900, JEOL) taken at various time scales(figure 1). Fig. 1. SEM of treated POF in acetone for 30 sec(left, wrinkled clad layer shown) and for 5 min(right, clad removed clear surface shown). Fig. 2. Effect of added “SM” binder on light absorption and rate constant(iso-propanol 290 ppmv in 650 ml reactor). Selection of chemicals to immobilize photocatalyst on the surface of stripped optical fiber was main research topic in using POFs. For about two years of trial, suitable binder-like chemical(we call it “SM”) has recently been identified and under investigation in terms of stability, light characteristics and harmfulness(figure 2). In addition, reactors of various shapes(cylindrical, rectangular, filter-type etc.) have been designed and tested using a couple of probe materials to obtain promising results that support superiority of these POF systems(figure 3). Light sources were a 1 kW Xenon lamp(from Oriel) and a couple of UV lamps with different size. Gas chromatograph(GC w/ electron capture detector and mass selective detector, Hewlett Packard 5890) and FTIR were main tools for analysis. Fig. 3. Various shapes of POF reactors(rectangular, radial, and cylindrical reactor). Before performing various experiments, light transmittance characteristics of QOF and POF were investigated and compared qualitatively. In the case of POF the amount of light transmitted was lower than in QOF and also in particularly light with a wavelength less than 300 nm can not be transmitted via POF. This range of light is to be absorbed by PMMA, will structurally degrade PMMA. While the stripped fiber has lower light transmittance ability due to refraction at the exposed surface, the coated fiber has much lower transmittance with increasing coating times due to the light absorption by TiO2. 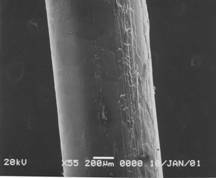 The effect of POF diameter, coated thickness, number of fibers, and length of fibers has been identified and used as basic data for further engineering design. A gas chromatograph and FTIR study showed that reaction byproducts, which actually proved that photocatalysis happened in POF system. So far, five POF reactors with different size have been prepared. Some of them are shown in figure 3. Rectangular reactor has volume of 2,366 cm3(36.4 cm ´ 6.5 cm ´ 10 cm in height(H)) with TiO2-coated area of ca. 3,600 cm2. This reactor includes 900 POFs(1.5 mm in diameter(D) and 10 cm in length(L)) and gets 350 ppmv of trichloroethylene(TCE) converted within 10 min with good reproducibility. TCE was completely degradation into CO2(by FTIR) and by-products identified by a gas chromatograph were acetaldehyde, formaldehyde, and acetic acid. A gas chromatograph and FTIR analysis was well matched in terms of time when by-products and CO2 were generated. Radial reactor has volume of 4,973 cm3(outer D 8.52 cm, Inner D 2.52 cm, H 24 cm) with TiO2 coated area of ca. 3,000 cm2. This reactor is filled with 1,280 POFs(1.5 mm in diameter and 5 cm in length). In this reactor 250~1,000 ppmv of methyl tert-butyl ether(MTBE) was converted in 10~30 min. MTBE was mineralized into CO2 with molar ratio of one to five. Within 10 minutes after the reaction initiated the first byproduct, tert-butyl formate(TBF), has appeared drastically followed by acetone. Acetone was also major component among several byproducts in our experiments. This result was also verified by the fact that photocatalytic degradation of TBF and tert-butyl alcohol(TBA) as a starting material, producing acetone commonly. Fig. 4. Isopropanol(IPA) conversion with the light guided reactor (Solar simulator, 8 ~ 15 mW/cm2 @ 360 nm, IPA 290 ppmv). These reactors have been tested and modified in a way of easy handling, excellent light-utilizing ability and high rate constant. As previously mentioned, reaction rate is much higher when binder component is not used. Hence, when high rate is necessary, the use of photocatalyst-sol without binder in designed filter-shape reactor would be another possibility. 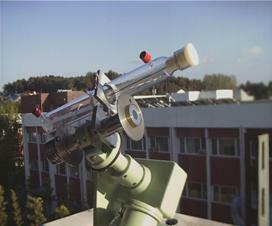 Cylindrical reactor attached to a solar tracker(EPPLEY Lab. Inc., USA) is prepared for the possible use of POF in sustainable air purification. This contains twelve POFs in 650 cm3 where 350 ppmv of TCE was converted in 60 min. Finally, bundled array with 130 POFs each of which is 2 m long and only 20 cm is coated has been prepared. This reactor is with both solar concentrator to increase light intensity and water filter to prevent POF from melting(bottom-right placed light guided reactor in figure 3). Hoffmann et al. has tested the use of solar light in photocatalysis with QOF. Hence, the aforementioned set-up apparatus will be mainly operated to check the feasibility of POF in solar-driven photocatalytic system that degrade low concentrated gas phase noxious chemicals, e.g. volatile organic chemicals and odorants. Experiments to convert isopropanol(IPA) were conducted and result is shown in figure 4. Acetone was produced while IPA had been converted with unidentified by-product shown. The conversion rate got faster when the reaction was performed repeatedly. This is due to the increasing exposure of activated surface of photocatalyst. The use of POF in photocatalysis with an appropriate light source turned out promising in terms of high efficiency and widened fields of application. Eventually, the difference of reactivity between POF and QOF was negligible under our conditions. Various light sources could be used with POF because they do not irradiate light with wavelength shorter than 300 nm. The low cost of raw material and fragility also enhanced the versatility of POF system. Even though a spate of initiative works with POF have been performed with promising results in hand, it also brings a demerit, difficulty in TiO2 immobilization due to lack of heat resistance of POF. More intensive work to resolve the arising issue is essential in the near future. 1. H. Joo et al., “The Use of Plastic Optical Fibers in Photocatalysis”, Solar Energy Materials and Solar Cells, in press (2004). 2. M. R. Hoffmann and N. J. Peill: Environ. Sci. Technol., 29 (1995) 2974.